As a young child (or perhaps even an adult) who hasn’t dreamed of living tree houses? Some structures are built on trees or hung from trees, but some unusual tree house building designs are even grown from trees or built right into a tree. Some people live in trees as a luxury, some to help save the environment and others out of tradition or necessity. These modern natural tree houses may be the solution to the whole economic system we’re going through these days. Yes, we could start living in trees and that’s because these can be designed with “sitting and sleeping benches, storage spaces, a mini-kitchen, heating, glass windows, lighting, as well as a sound system for multimedia”. These incredible looking tree houses are called ‘Free Spirit Spheres’ and are designed by Tom Chudleigh, and is an eco-friendly living quarter that was created to co-exist unobtrusively with its forest environment. Wooden spheres are built much like a cedar strip canoe or kayak, suspension points are similar to the chain plate attachments on a sailboat and the stairways hang from a tree much like a sailboats shrouds hang from the mast. The 4TreeHouse was designed by Lukasz Kos a masters student at the University of Toronto’s School of Architecture & Design. Posing as a Japanese lantern on stilts, Kos’ creation floats within the fir trees on Lake Muskoka, Ontario, an elegant slatted structure that scales the trees and lets light radiate down it’s core. German cooperative Baumraum knows how to keep imagination alive in their homes. They create treetop dwellings which integrate beautifully into their forested surroundings, and preserve the integrity of the trees that support them. With the breezy playfulness of a hammock and the trusted stability of an old oak tree, Baumraum won’t make you grow up to enjoy a sophisticated house. Now you can have your very own tree house with a cool design thanks to Baumraum an architects studio from Germany. Dustin Feider had a different vision: one that would be good for the tree, the environment and the deep human need to reconnect with nature and our primordial roots. Through his company, O2 Treehouse, Feider is out to revolutionize not merely tree houses but the entire concept of habitat. All the materials used for the tree house are entirely recycled – and while the original O2 Sustainability Tree house is 13 feet wide, interiors and sizes can be customized according to customer specifications. When the Duke and Duchess of Northumberland laid out plans to create the largest public gardens in all of Europe, they commissioned the Tree House Co. to create a gigantic tree house that would house a 120-seat restaurant, a retail shop, two classrooms, and tow private dining rooms. Opened in January, 2005, the Tree house at Alnwick Gardens is a labyrinth of turrets, treetop walkways, and cavernous spaces. At 6,000 square feet, it’s one of the largest wooden tree houses in the world. 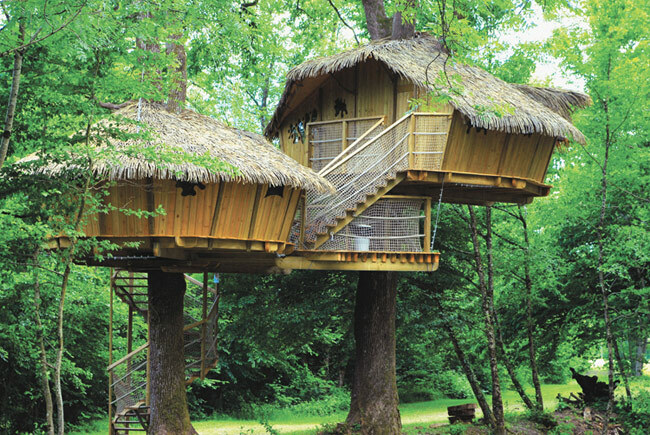 Treehouses are fun and bespoke extensions to your home and garden. 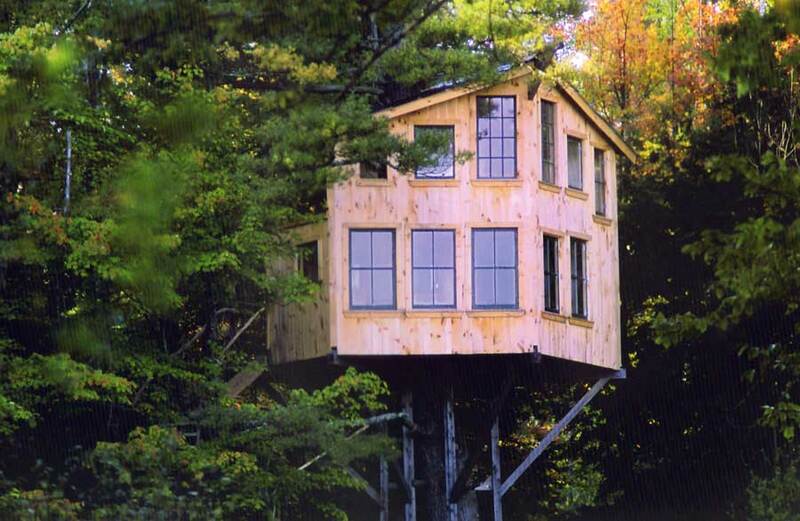 High Life Treehouses can create a beautiful secluded haven or make a stunning focal point in your favourite tree, providing an ideal spot for entertaining, an office or play house. The possibilities are endless! 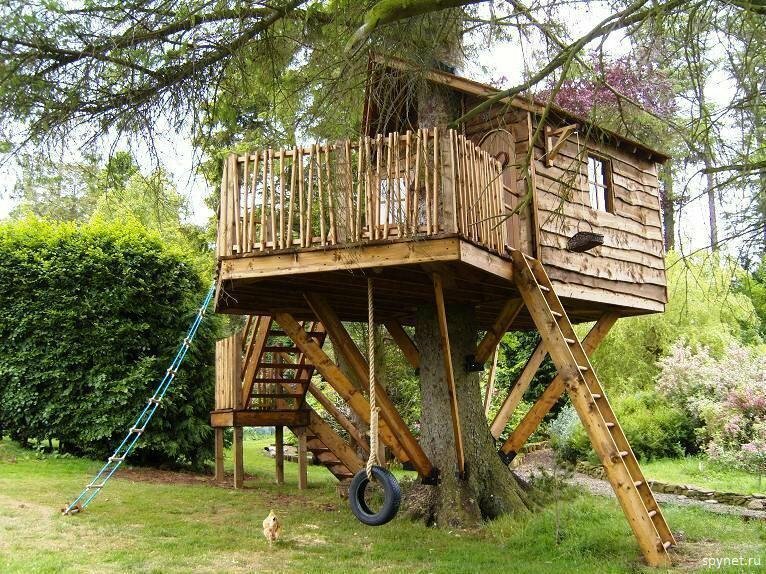 Treehouses appeal to the child in all of us and bring us closer to nature. At one point you probably dreamed of living among the birds in a house nestled on the leafy branches of a towering tree. Whether these structures are tiny shacks clinging to a single bough, unique treetop observatories or sprawling works of art spanning several trees, there’s something magical about treehouses. Here’s a look at 18 of the world’s most stunning treetop structures and the unique stories behind them. Terunobu Fujimori’s tea house, Takasugi-an, which literally means “a tea house too high,” stands in Chino, Nagano Prefecture, Japan, atop three chestnut trees. The house is accessible only by ladder, and guests must remove their shoes and leave them on the platform before venturing inside for tea. As an architect, Fujimori is known for his innovative and often whimsical designs, and this freestanding structure certainly pushes the limits of a conventional teahouse. Tree House: Located outside of Belzig, East Germany is suspended by 4 cables.